It's Sewcialists Sew Style Hero Month! And this one is for Andrew/ BusterSews/ Mensew, because his blog is just a delight. It's a men's, albeit in miniature, pattern. 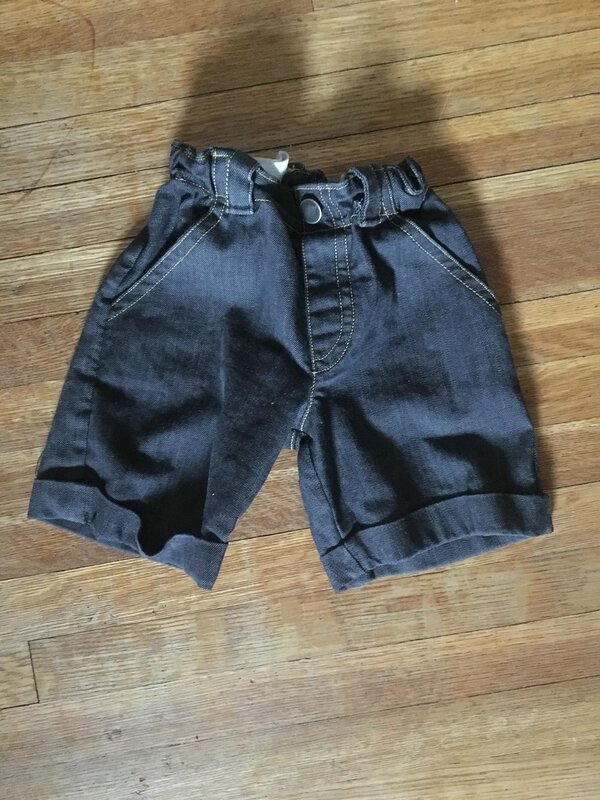 In a reversal of sewing-little-girls-dresses as an out of the ordinary sew, this is sewing proper little boy clothes (although, of course, bermuda shorts are also an entirely gender-neutral item, BUT NOT FOR THE PURPOSES OF SEW STYLE HERO MONTH! ), out of wovens rather than my usual forgiving knit. 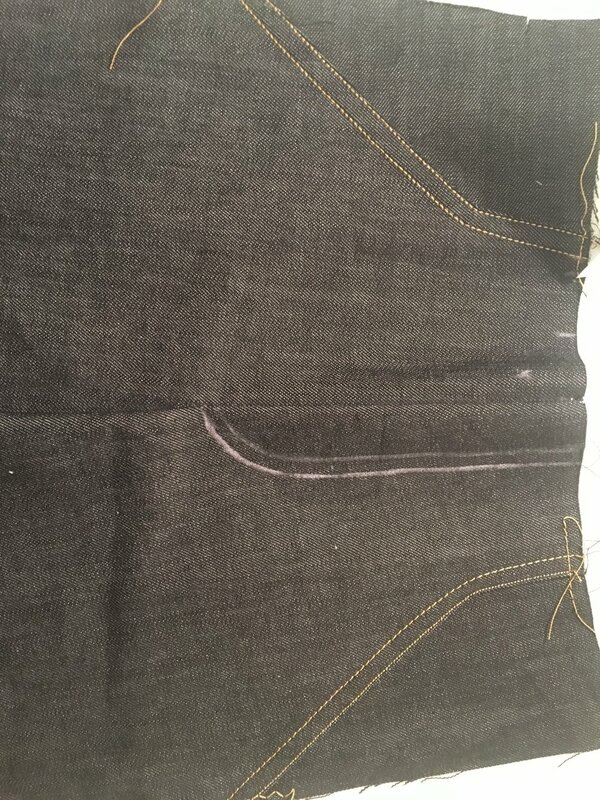 The pocket topstitching would never have occurred to me if Andrew hadn't done a sewing machine on his jeans for pride! I did not, however, use rainbow serger thread because I have neither a serger nor rainbow thread, and no trips to the shop happened for this make. I briefly considered writing this on my phone as really this is something of a sewing/blogging process tribute, but I am garbage at typing on my phone. I love Andrew's blog for many reasons, but mostly I love reading construction details and seeing menswear options. Plus the sentences are good. The pattern in question here is the Faro Shorts from the La Maison Victor May/June 2018 issue. I bought this for myself in Berlin at a magazine kiosk/corner store across from the Boros Bunker (extraordinary art collection. They do being rich RIGHT. ), in German, in part as a souvenir & challenge and in part because I didn't realize that La Maison Victor had launched in English. Really, if I'm going to get something in another language, I want it to be in French or at least Spanish so at least I'm practicing a language I know (or sort of can get my head around, in the case of Spanish). So, using the last bit of black denim from my Ginger Jeans, then Ginger Shorts, I managed to JUST cut out enough for size 3 children's shorts. Yay for no more leftovers! I almost forgot to add seam allowances to my pattern pieces, but they just fit with; another yay! Sewing finally started a month later, and sewing evening 1 resulted in just about finishing the fronts, just short the topstitching at center front, but 10 p.m. is officially too late to try that when one is in the midst of night-weaning a teething child, especially when one's topstitching between 9:15 and 10 had been inconsistent at best. The La Maison Victor visual instructions are mostly quite clear, but I definitely needed the google machine's skill to figure out that the front legs went together and were treated as one piece to create the mock fly. Since I sewed the fronts together before topstitching, I was extra-careful about the placement of my last stitch, and, as I have for most of the topstitching on these shorts, I pulled through the stitching to tie off by hand for a cleaner/more precise finish. 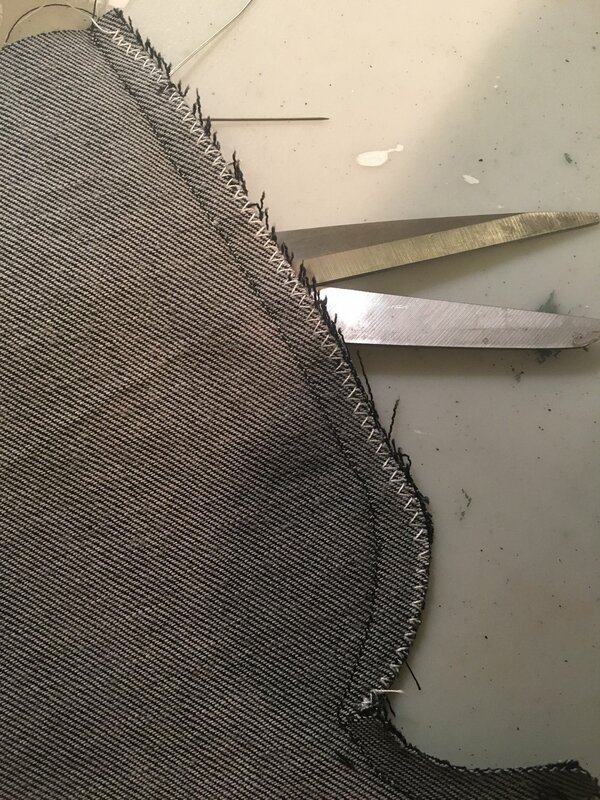 I opted for one line of topstitching down center front and center back because none felt empty and two felt like too much real estate on the tiny lil kid shorts. In a burst of genius I remembered the cool sewing machine topstitching Andrew did for his last pair of jeans, and I realized that a train would be of similar straight-line acheivability and be as relevant to my child's interests. 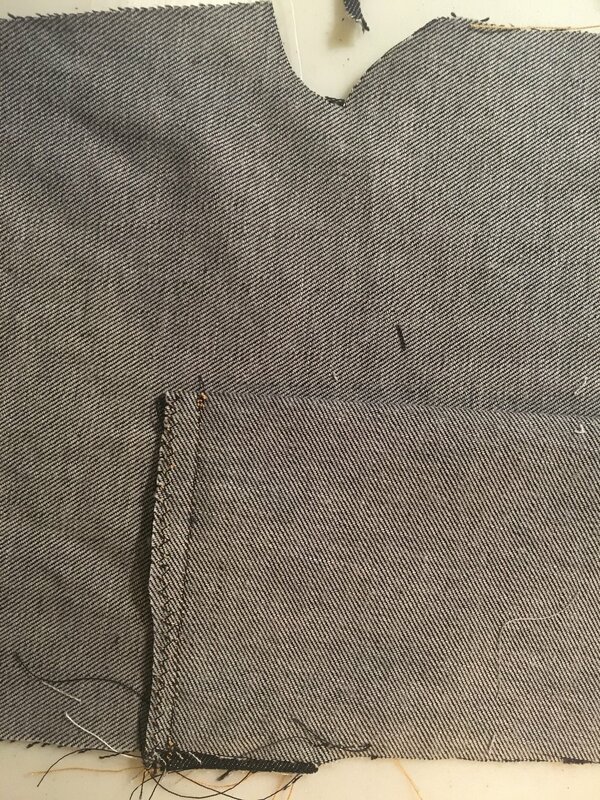 Chalk pencil and ruler in hand, I sketched out a simple train engine and set to work topstitching it. Much painstaking hand-turning of the wheel and hand tying short bits of stitching ensued, but the little choo-choo train is pretty cute. Ok, actually I love it! I ran into some trouble come the waistband, going at things more or less on autopilot and quite confused by the front and back waistband pieces that just did not seem like they could enclose a 1-inch elastic, but assuming it would come together. I finally saw the light of the design, which, like so many things, seemed super clear in retrospect: the two little waistband pieces were essentially facings, and the outside of the shorts would actually form the outer part of the waistband. This is cute and slick and resulted in a great horrible deal of unpicking, because of course my beltloops were on backwards (with clear backstitching) for a more standard waistband-attached-to-the-top-of-the-pants situation (I'm pretty sure had I been able to read ahead in English none of this would have happened). Thankfully my husband kind of likes unpicking. My machine decided that bar tacks in the topstitching thread would look uniformly terrible, so I carried them through the back three loops but switched to matching thread for the front loops, which look much better. I realize, of course, that this is the end of August, and by the time these were completed, summer had almost entirely run its course; what heat was left to us more or less entirely cancelled out by intense smoke from the Alberta wildfires. However, I cut out the size 3 because baby was exactly the measurements for a 2, and the clever little waistband elastic is meant to be adjustable via two little buttons, so these should fit very nicely next year. They are a little Kevin Smith right now. I assume the boy will love trains at least similarly a tonne next year, too. I should note: I did not have buttonhole elastic on hand, but did have regular knit elastic, and just cut holes in at eyeball/random distances. It works. Anyway! I hope these lil shorts and the accompanying foray into languages I don't understand is a good tribute for Mister Buster Sews!